​Gouache (Gwosh) is a term used to describe a water-soluble paint that is opaque rather than transparent like watercolour. The earliest signs of the method date back to the Ancient Egyptians who bound their pigments with either gum tragacanth and/or honey. Opaque, bold colours were desirable when painting on papyrus, buildings and tombs. From the 12th century onwards it is the characteristic meduim of Indian and Islamic miniatures. In the Middle Ages, European monks began to introduce glue to their pigments and over time discovered that by adding chalk powder or zinc white they created opaque paint with strong covering power. This technique was used for the preparation of Illuminated Manuscripts. Although it was not well known as a fine arts medium there are many examples of European painters using it as such including Durer, Degas, Van Gogh, Matisse, Van Dyck and Picasso to name a few. During the late 19th and 20th century the demand for 'designers colours' for commercial use meant that gouache ceased to be regarded as a serious art material. Today as designers leave paint for photoshop, gouache is returning to the attention of professional fine artists. Like the Egyptians, there are many that love the qualities of this paint. Gouache is an opaque, waterbased paint that is sold in tubes or jars. I have used Pelikan and Windsor & Newton and find that both work well for me. 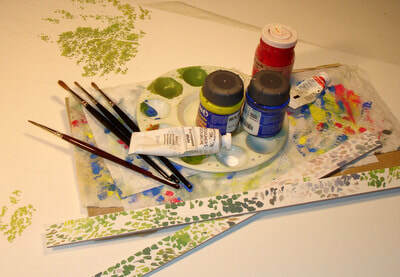 Gouache dries quickly to a smooth, matte finish, however dark colours will dry lighter than they appear when wet, and light colours will dry darker. For this reason I keep a strip of illustration board beside my work and test my colours before painting. Although you can paint one colour on top of another and cover it completely, do this with care because gouache can develop cracks when applied too heavily. You can achieve a transparent effect if you add more water to your paint. If you have paint remaining in your palette keep it for you next painting session. You can revive it by adding water to it. I paint on a double thick, cold press illustration board and keep coming back to it after having tried a few different surfaces. Protect your work while painting. The paint will scuff easily, be damaged by water marks or your finger prints. I have recently started spraying my finished paintings with a coat of varnish (Pebeo - Watercolour and Gouache Varnish), allowing me to frame work without glass. The trade off - the colours will darken, one of the reasons I no longer use black when painting.